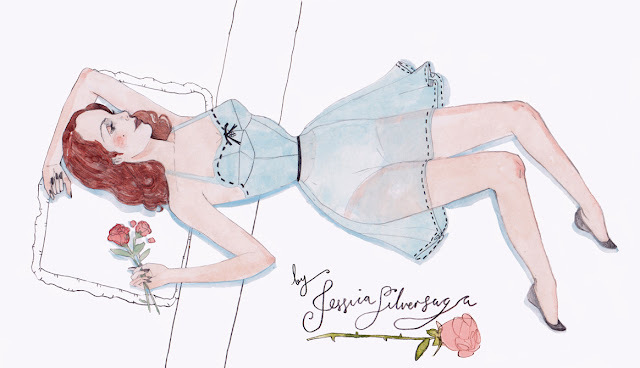 A blog header made for the divinely talented photographer Jessica Silversaga. Oh, how i love this enchanting girl! the detailing on that dress is so, so beautiful. I love the stitching on the dress! And the contrast between the lightness of the dress and the darkness of the stitches. Beautiful! yet another beautiful illustration, you're so talented! I am the happiest girl in the world! Thank you Caitlin! How much would it cost to commission a blog header? i'm happy to discuss this over email and i can happily work with a clients budget. please get in touch via caitlin.shhh@hotmail.com.